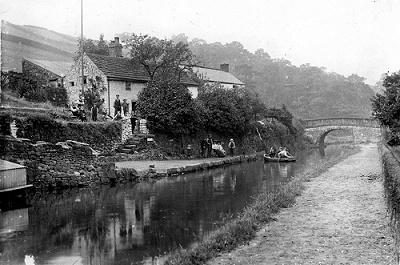 Before Oldknow's time Marple was mainly a collection of isolated homesteads involved in the cottage industries of the time. 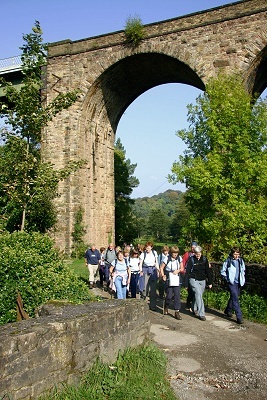 The walk is based on the original leaflet produced by the late Gordon Mills in 1998 and was first published on this site with his permission in the same year. 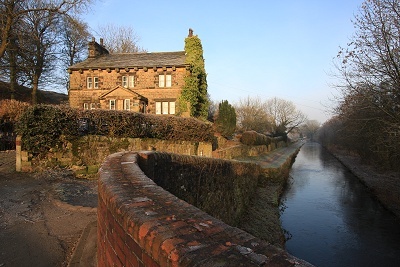 It is the first of Gordon's walks to be updated in partnership with Marple Local History Society as part of a longer term programme to ensure that these historic guides remain available for people to enjoy. 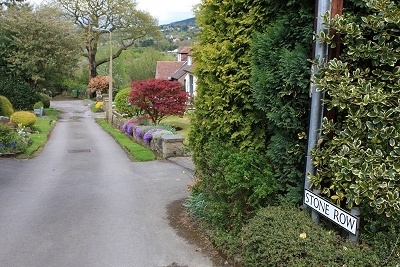 The walk has been checked and updated by David Burridge, an active member of the society, and the revised leaflet is available for exclusive download here: Walks Around Marple No. 2 - Marple Dale. For a map with satellite and hybrid views of the route, use this link to Google's Pedometer: Walk 2. The text from the guide is reproduced in default grey and the photos originally used by Gordon in his guide have been supplemented with others from the "Virtual History Tour of Marple & District" and more recent colour photos. Additional text in the on-line version only is coloured green. 1) We start in the Memorial Park in the centre of Marple, home of Thomas Carver one of the owners of Hollins Mill and another of Marple's benefactors in a later period. 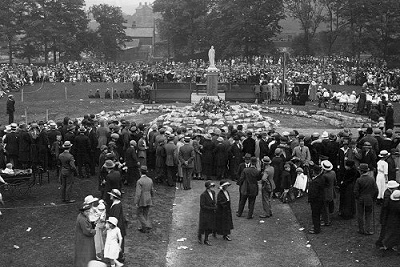 (Memorial Park was gifted to the people of Marple in July 1922). 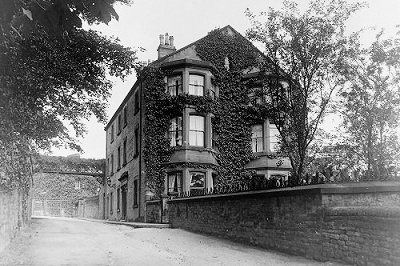 Hollins House in Marple Memorial Park & The dedication of Marple's War Memorial in July 1922. If time permits, take the path down the centre of the park with the bowling green to your left. This offers magnificent views towards Mellor Church on your right. After about 150 yards, the path forks to the right and down to the canal by Lock 10. Turn right here to follow the towpath and rejoin the main route. 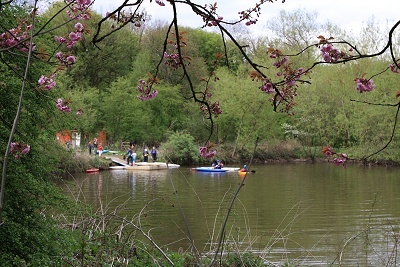 Another alternative, which is particularly enjoyable in spring when the daffodils and bluebells are in flower, is to cut back inside the park from lock 10 and follow the path through the trees on the perimeter running parallel with the canal. 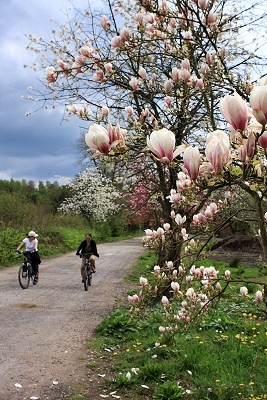 You would then rejoin the original route when you reach the opening onto the canal towpath at lock 12. Take the path passing to the right of the skateboard area, down to the canal towpath near Lock 12. Turn right and make your way towards Posset Bridge where Oldknow supplied ale posset to the workers to ensure the bridge was completed on time. Notice that there are two arches at the bridge; the blocked-off one on the left led to an arm of the canal running towards the Lime Kilns. Climb up the steps at the bridge and turn left. 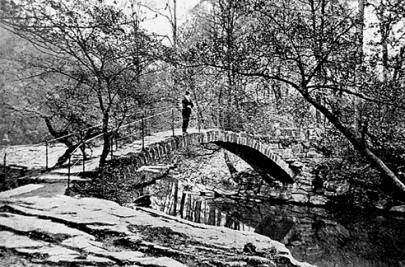 As you cross the bridge look to your right; this is how the scene would have looked in the 1920s. 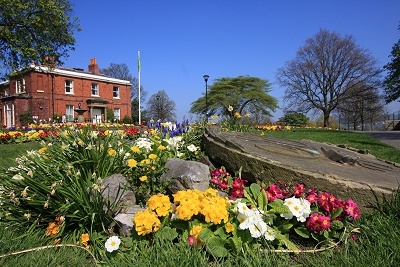 Today, on the grassed area where the canal arm used to run is a flowerbed display know as "Lock 17" that was created as a joint project by Friends of Marple Memorial Park and Marple Locks Heritage Society. 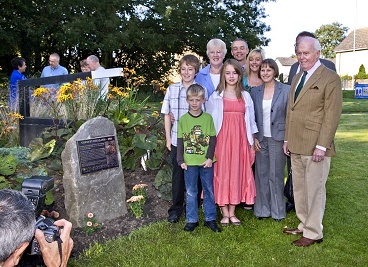 In September 2009 a bronze plaque was unveiled by Gordon Mills' widow, Barbara, and the display was dedicated in his memory. 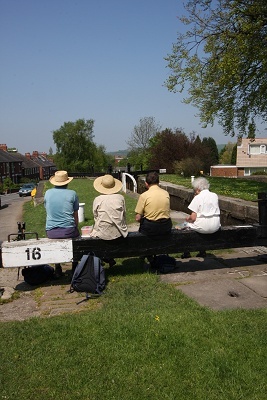 Gordon's family are shown below next to the bronze plaque, which features the cover images of this and the Marple Locks and Brabyns Park walks. Use this link to learn more about the "Lock 17" project. 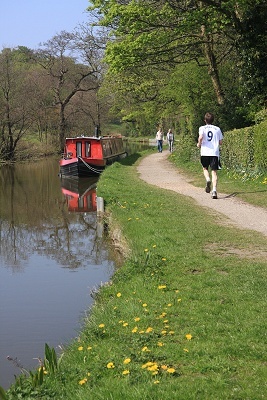 The canal arm running alongside Strines Road to the loading house below the lime kilns & Gordon's family next to the plaque dedicating Lock 17 to his memory in 2009. 2) At the junction with Arkright Road cross over and down Lakes Road. 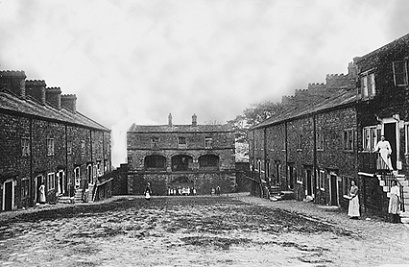 On the left where there is now a group of bungalows stood the cottages of Stone Row. The 35 cottages were built by Oldknow to house the workers at his nearby mill and their families. Stone Row as it was in Oldknow's day & as it is now. Carry on ahead past Beechwood Manor, formerly a house belonging to the railway but now private flats. 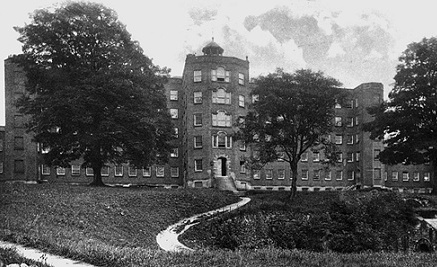 Beechwood Manor was once the residence of Edward Ross, secretary of the M.S.L. Railway. 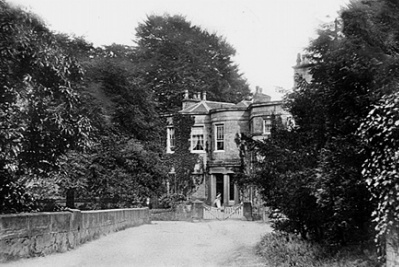 When Ross lived here there was a footbridge connecting the manor to the garden above Marple South Tunnel. Sadly this was removed sometime in the 1970s but you can still see where it was attached to the stonework on both sides. As we descend the hill we can appreciate the difficulties the railway engineers must have experienced when carving the line along the hillside. 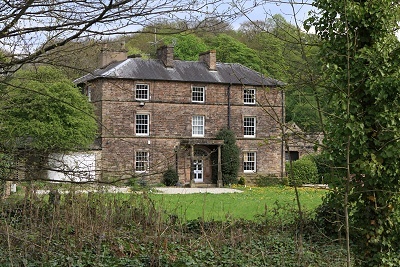 3) At the bridge over the River Goyt stood, on the far side, Mellor Lodge, Samuel Oldknow's house and on this side Marple Lodge, the mill manager's house. In the 1930s Oldknow's fine house became a girls' school but later it was vandalised when it stood empty and was demolished in 1949. 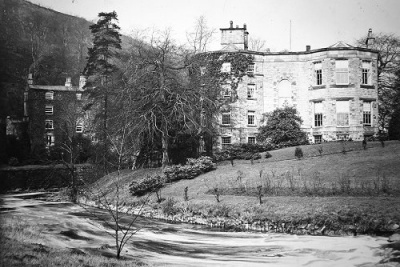 Comment from Heather Plevin, nee Hines, who lived in Flood Gates Cottage from 1939 to 1954: The side gardens of Mellor Lodge faced the Mill's main frontage. Our friend and neighbour Miss Ella Cecelia Furniss, an elderly lady, lived at Strawberry Hill, a lovely home near the Roman Bridge. (Miis Furniss's late father was agent for the Oldknow/Arkwright Estate). 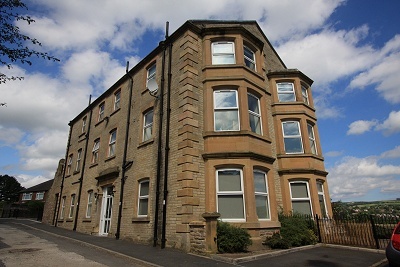 She attended Mellor Lodge - an exclusive young ladies school. I remember both Mellor and Marple Lodges standing. Also a stone house with gothic style windows [the Garden House] in the field on the Marple side of the River Goyt. It was demolished and the area became a council tip. Miss Furniss's uncle Edwin lived in "Old Hall". He was then in charge of Roman Lakes etc. At weekends he was in the box office of the lake (6d entry) while his niece supervised the tea-room with helpers Mrs Harrop and "young" Phyllis from Mellor (who was at least 60 or 70 years old). I only just remember seeing dancing (music by Mr Chew) later conditions [of the dance hall] made made it unusable and, perhaps times having changed, unwanted. Later a Mr Stan Burgess was manager of the lake. The Strawberry Hill Furniss's are buried at Mellor Church. 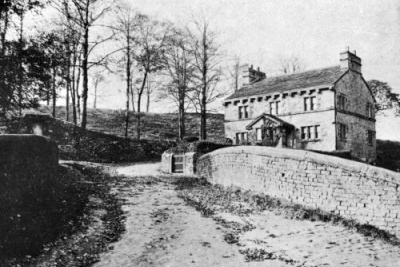 Mellor Lodge, the home Oldknow built for himself & Marple Lodge (left) and Mellor Lodge. 4) Cross the bridge and bear right at the fork. You will need a powerful imagination to picture the scene here over a 100 years ago. 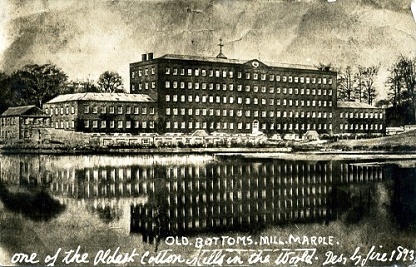 On the left was Oldknow's Mellor Mill or Bottoms Mill as it was also known. The brick built building was over 400 feet long and was powered by 3 massive water wheels, the largest of which was 22 feet in diameter and 17½ feet wide. Mellor Mill - front view facing the river & The Corn Mill. In 1892 a disastrous fire destroyed the mill but the Corn Mill, which was a little apart from the main mill, escaped damage and survived until the 1930s. The Corn Mill stood close to this junction of the two paths. 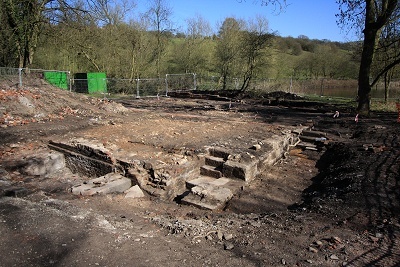 Little remains of Mellor Mill or Oldknow's other buildings in this area but close investigation of the site will reveal a number of underground tunnels and foundations. In 2009 the Mellor Archaeological Trust exposed the foundations of the Corn Mill and led guided walks around the remains. 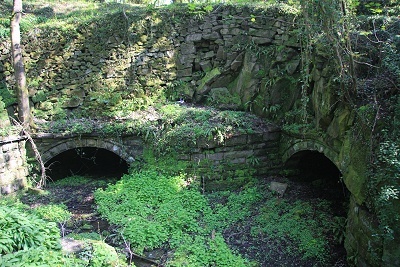 Tunnels from Mellor Mill as they are today & Foundations of the Corn Mill exposed in March 2009. Looking to the left as we make our way up Lakes Road we can see the mill pool, which was adjacent to the back of the mill. 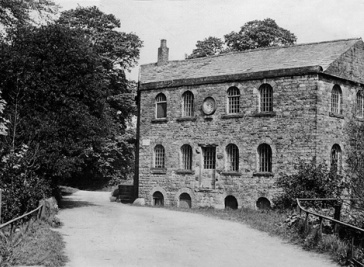 The oval shaped shuttle stone, dated 1790, that can be made out in the triangular pediment at the top of the mill in the old image below is now in Marple Memorial Park. You can see it in the foreground of the image of Hollins House at step 1 of this guide. 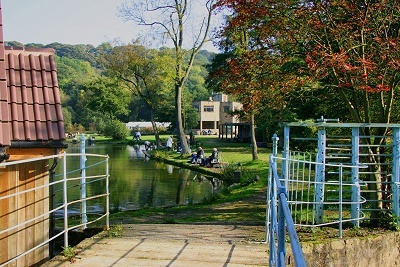 Rear view of Mellor Mill and the mill pond & Today the mill pond is used for canoe training. 5) At the next junction take the path to the right. Through the trees you can see Bottoms Hall built in 1800. This is where some of the 100 apprentices lived who worked in Oldknow's mill. The children, both boys and girls, were mostly paupers from Clerkenwell in London. They worked 13 hours a day for 4 shillings (20p) a week, but it is understood that they were well treated by the standards of that time. 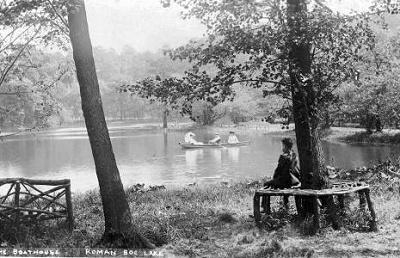 Bottoms Hall & Entrance to Roman Lake. Continuing along the track we pass the Roman Lake. This was a very popular spot in Victorian and Edwardian times when excursion trains would bring hundreds of visitors to Marple Station. Besides the rowing boats available for a small charge there were tea rooms and a dance floor. Boating on Roman Lake & Flood Gates Cottage as Webb's Tea Rooms. A little further on the river runs alongside the track and under the viaduct. The weir is where Oldknow redirected the river to form the pools that would provide water power for his mill. 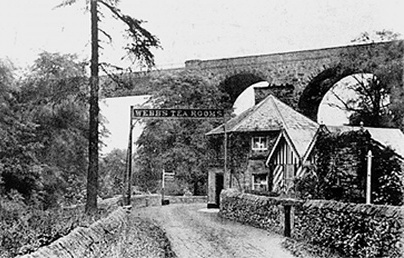 On the left is Flood Gates Cottage which many years ago was a popular place for refreshments for the many visitors to the area. 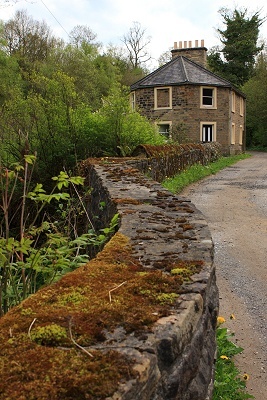 Road past Roman Lake, Passing under the viaduct & Flood Gates Cottage. 6) The track moves away from the river and we turn right just by the "Roman Lodge" (following the sign to Strines) to reach the Roman Bridge. 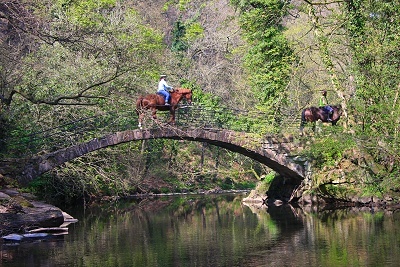 The "Roman" tag was coined in Victorian times to add a little romanticism to this packhorse bridge dating back to the 17th century. Roman Bridge & Roman Bridge today. Crossing the bridge we follow the path beside the river ignoring the steps on the right. The path joins a narrow road near two cottages and then makes its way up the hill to Strines Road. Cross over and up Plucksbridge Road. 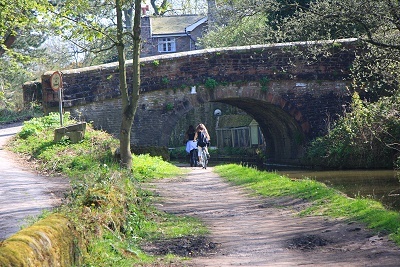 As the canal is reached, turn right to enter the towpath just before the bridge. 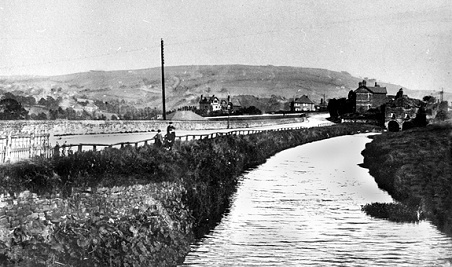 Looking back to Plucks Bridge & What you would have seen the other side 100 years ago. 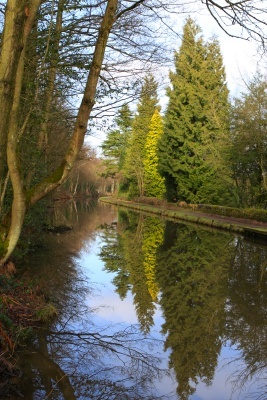 7) This is the Peak Forest Canal and Oldknow was a major sponsor for this waterway. 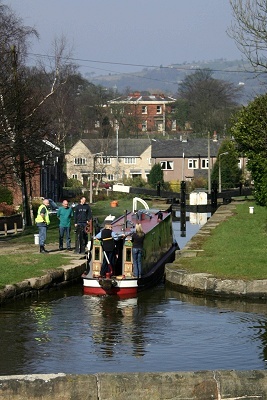 The canal runs 6½ miles to Whaley Bridge and Buxworth and it was here that limestone was brought down from the Peak District by tramway. 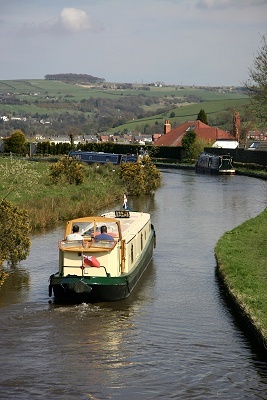 As we make our way along the towpath there are extensive views across the valley to Cobden Edge and Mellor Church. Peak Forest reflections, From bridge number 20 & Peak Forest towpath. 8) Some 200 yards short of Brickbridge the canal on the far side is a little wider, and marshy ground leads into a woody section. This was the site of one of Oldknow's coal mines used for burning of the lime in the kilns. Brickbridge is a roving bridge where the towpath changes sides and you will notice that we pass under the bridge before circling round to cross it. This was to enable the rope of the horse drawn narrowboats to remain attached. Brick Bridge with doorway in wall to All Saints' left & Brick Bridge on a recent frosty morning. As you cross the bridge you will notice a door set in the wall ahead. This leads to another Oldknow coal mine and also a footpath leading up to All Saints' Church which was used by the apprentices on their way to Sunday worship. 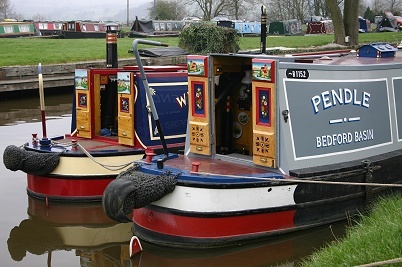 9) Turning right to follow the towpath, ahead we can see a number of boats moored in a pool off the main canal. This was adjacent to the top of the Lime Kilns where the lime and coal was dropped into the kilns. 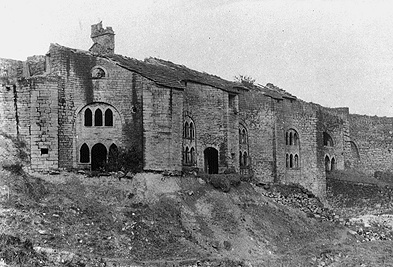 Such was Oldknow's concern that the Lime Kilns did not present an eyesore, that he built them in a gothic style that led later to visitors to the area to assume it was a ruined abbey. 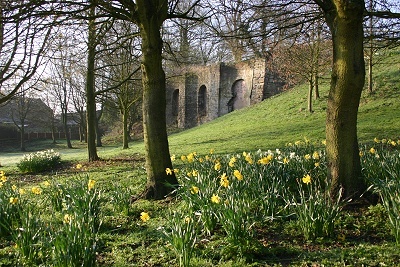 The Lime Kilns & The Lime Kilns in a recent spring-time. 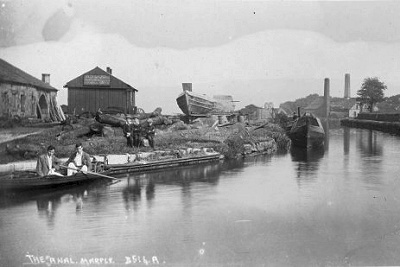 Top Lock Boats & Top Lock around a century ago. Make your way past the top four locks of this flight of sixteen. Pass under Posset Bridge using the short horse tunnel and make your way back to the car park. 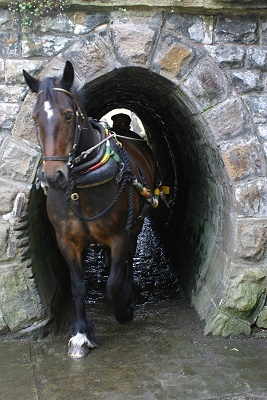 Lock 16, Lock 15 & The Horse Tunnel. This guide was originally designed and produced by Gordon Mills & Co. on behalf of Marple Community Council © 1998. It has been reproduced with permission by The Marple Website and Marple Local History Society and re-published in memory of Gordon Mills 1935 - 2006.